Many of the volcanic seamounts in the Gulf of Alaska are visible on this bathymetric map. Only a few of these have been studied. We will explore five seamounts this summer. Click image for larger view. Seamounts in the Eastern Gulf of Alaska: A Volcanic Hotspot with a Twist? Seamounts -- or underwater mountains -- are scattered across the Gulf of Alaska sea floor. They act almost as submerged islands, abundant with marine life, in the otherwise sparsely inhabited abyssal depths. The largest of these seamounts is more than 3,000 m (9,900 ft) tall; some extend to within a few hundred feet of the sea surface. Many seamounts occur in long chains, extending southeast from the northern parts of the Gulf of Alaska all the way to the western coast of the U.S. and Canada. We know the relative age of these seamounts: the northernmost ones are generally the oldest, and they get progressively younger toward the southeast. This progression in age reflects the order in which the seamounts formed, which can be explained by the Pacific Plate's movement over a group of hotspots (now off the coast of Oregon, Washington, and British Columbia). On our 2002 Gulf of Alaska expedition, we examined one of these chains and found that, for the most part, it followed the hotspot model. This year, we will return to the Gulf of Alaska to look at another of the chains. The formation of this one, however, does not appear to fit the hotspot model quite as well. Earth's outer shell is made up of tectonic plates that move around, creating earthquakes (where they jostle against each other) and volcanoes (where they split apart or push underneath each other). Some volcanoes, however, occur within plates, far from the boundaries between plates. Each of these within-plate volcanoes stays active for a few million years. Lava streams out of its summit and down its flanks, building up a volcanic mountain. This is similar to what is happening on the island of Hawaii today. In fact, we can look to the Hawaiian Islands to help us understand the Gulf of Alaska seamounts. Consider that not all the Hawaiian Islands are volcanically active. In fact, the islands become older the farther you move northwest. Thus, the Big Island is currently active; Maui is recently, but not currently, active; Oahu is no longer active; and Kauai, the northwestern-most of the main islands, has not been active for millions of years. This is because as the Pacific Plate (the tectonic plate on which the Hawaiian Islands ride) moves toward the northwest it passes over a hotspot of lavas coming from deep within the Earth. Over time, as each volcanic island in the Hawaiian chain built up from repeated volcanic eruptions, the developing island was carried away by the moving plate (as if on a conveyor belt), only to be replaced by another island that formed in its place. ScienceProf.com has a nice animation of how the Hawaiian Islands formed . The hotspot explanation also applies to many seamounts in the Gulf of Alaska. Again, the Pacific Plate moved toward the northwest, passing over a group of hotspots off the western U.S. and Canada coasts. The movement of the Pacific Plate created the long seamount chains we see today in the Gulf of Alaska, where the oldest seamounts are at the northwest ends of these chains and the youngest are at the southeast ends. The most obvious and complete example is the seamount chain, which was created by the Cobb hotspot. This "trail" of hotspot-created seamounts extends from the presently active Axial Seamount, located off of the coast of Oregon, all the way to a point just south of Kodiak Island in the northern Gulf of Alaska. In 2002, we studied several of the seamounts in this chain and found that their ages fit the hotspot model. This summer, we will be studying a different chain of seamounts in the Gulf of Alaska, one that does not fit our hotspot model of formation quite as well as we would like. This chain extends from Kodiak Seamount, just east of Kodiak Island, down to Bowie Seamount, west of the Queen Charlotte Islands in British Columbia. It is aptly named the Kodiak-Bowie Seamount Chain. Although some of the seamounts in this chain appear to follow the expected age progression for a hotspot trail, others -- such as Denson Seamount -- are older than they are "supposed" to be. Still others, such as Dickens and Pratt, fall a little to the side of the chain's expected trend. There's another twist to this seamount chain's story: the current location of the hotspot is not entirely clear. The youngest seamount in the chain is Bowie, but it doesnt appear to be currently active. This contrasts with the Cobb-hotspot chain that we studied in 2002, which has a large, volcanically active seamount (Axial Seamount) on its southeast end, where the hotspot is currently located. So either the Bowie hotspot is taking a rest, or there is recent -- but undiscovered -- volcanic activity on the sea floor on or near Bowie Seamount. We will be collecting and studying volcanic rocks from several seamounts in the Kodiak-Bowie chain to determine: (1) how long ago they were volcanically active; and (2) how the activity at the Bowie hotspot has varied over the course of the millions of years it took to form this seamount chain. We will derive this information back at our laboratories, where we will carefully analyze the volcanic rock samples. Eventually, we will determine how these ancient volcanoes formed and compare them to other hotspot volcanoes. The R/V Atlantis carries the deep submergence vehicle (DSV) Alvin, which we will use for our geological sampling program. Little is known about the shape of the Gulf of Alaska seamounts, and we need to find good rock outcrops to sample. That means our first task at each seamount is to create a bathymetric map, so we will know where to go. We will map each seamount using the SeaBeam swath bathymetry system on the Atlantis. The system measures the depth of the sea floor over a wide area at once, rather than just one point at a time (like a typical depth finder). 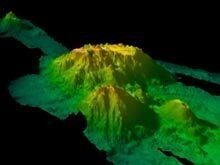 With this technology, we should be able to survey an entire seamount in less than one day. Once we have created a detailed map of the seamount's cliffs, spires, and flat areas, we will be able to select interesting-looking areas to explore and sample with Alvin. In 1999, we made a SeaBeam bathymetry map (shown below) of a Gulf of Alaska seamount. 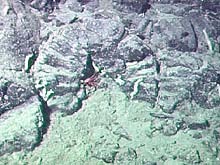 The sea floor image (below, right) shows the kind of rocks we will be sampling. This three-dimensional rendition of a bathymetric map shows Patton, a Gulf of Alaska seamount, which we visited in 1999, with two smaller seamounts in the foreground. Deep areas are blue, and shallow areas are red. Click image for larger view. The sea floor on Chirikof Seamount in the Gulf of Alaska shows the type of rocks we hope to find. Most of the rocks are fist- to head-sized chunks of basalt (a black volcanic rock). Click image for a larger view.